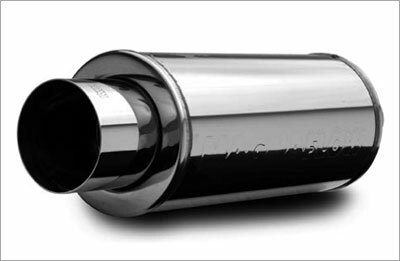 Non S drivers... if any of you have modified or had your exhaust modified with a Magnaflow or "the likes" muffler I'd really like to know what you think. I'm obviously interested in doing something like this to my 2011 non S. I know several muffler shops that do good custom work cheap as in inexpensive. I saw the VIP cat back system... more than I want to spend. Here are a couple of pictures; by the way, I am not looking anything other than looks and sound for this situation. 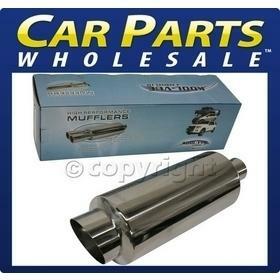 The tips on these mufflers are 4 inches diameter and overall length is 17.5 inches. Last edited by sleekbass; 06-18-2011 at 07:30 PM. I have a 2005 Justa. I put a miltek on mine back in 05. I have had good luck with it. last year I removed the resignator ... mostly for sound reasons. Now its perfect...not too loud but loud enough! Thanks... I bought a Miltek catback for a 2002 Golf VR6 some years back and I too loved it. I went with a Miltek for my R53, but my justa has the OBX. Reasonably priced, and the sound is subtle when cruising, but develops a nice tone when you hit the gas. i have a magnaflow XL with resonator delete on my 07 and absolutly love the sound. also throw a spectre intake system on it and ull love the sound. VIP Custom parts actually makes a bolt on cat-back exhaust for the justa cooper. It's listed for $549.00... I'm not sure what the a Magnaflow system cost for the non s cooper. That's very cool... how much did you pay for it? Which part number did you use? yes please! id like to know which one you chose, there are so many and i dont know where to begin to look. can you get a sound clip or a video? and not just reving but driving away so we can tell how it will sound 98% of the time? I try to get a sound clip for ya. well Sean5294 do you have it? Anyone ever gone headers back? I think I remember OxyBlue had done that (I could be off on his screen name since I haven't seen him around lately). I've really been eying that Remus catback since I read Slimjim Tell's review of his (Clubman S). The quality seems to be there, the sound seems really good and I like the look - it may sound strange, but I like that the back of the muffler is black so you just see that monster exhaust tip. I just see too many fart can mufflers on Honda's around here that are all bright and shiny. They drive me crazy. What would headers cost? And the pipes in between? I wish you could just take the one side of a Clubman S exhaust and slap it on our straight Coopers. Crap, I completely forgot to do this. Ill see what I can do. I heard a sound clip for the S version - definitely a nice tone. Any chance you can post some pics of the tip and muffler? I've yet to see one on a straight Cooper. As time has gone by did you make a clip? This sounds really nice, and it's a cooper one. Shame we can't find out the type of exhaust it is. I finally got a chance to watch that clip - nice sound. And I agree - although you guys both asked for details on the exhaust, no answer.